Grief is a natural and inevitable part of life. We usually encounter it whenever some important part of our life is lost or taken away. It is especially poignant when someone we love dies. Though it will never be a pleasant experience, grief can be rightfully and wrongfully handled. As Christians, we are not callous to our own and others’ grief simply because we have faith in the promise that a better day is coming. We are called to empathize, listen, and minister to each other during these most difficult times. 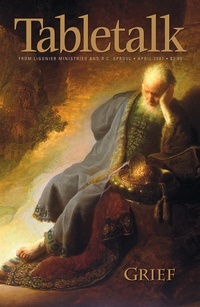 For this reason, the April 2007 edition of Tabletalk focuses on grief and how we Christians are to respond to it. This issue will serve to help Christians better understand the nature of grief as well as become better equipped to manage it. Contributors include R.C. Sproul along with Joel Beeke, Anthony Carter, Jim Coffield, Archie Parrish, R.C. Sproul Jr., and Gene Edward Veith. Tabletalk features articles about topics central to the Christian faith and daily, in-depth Bible studies.